Over the past few months, the Ottawa Senators have become masters of the late-day news dump. On multiple occasions in 2018, the Senators have quietly slipped out a press release around 6 p.m. Eastern Time – sometimes on a Friday – addressing negative news around the team. On Monday night, the organization found a strange, new way to announce their bold, fresh direction for the franchise. At 10:05 p.m. ET – when many of their biggest fans had either gone to sleep or stopped paying attention to the news cycle – the Senators released a nearly six-minute conversation featuring owner Eugene Melnyk and defenceman Mark Borowiecki. Considering Melnyk and general manager Pierre Dorion have not granted interviews about the direction of the team for several months, it was certainly a curious decision to allow Borowiecki to be the one to guide the conversation with the owner. Less than 40 seconds into the video, Melnyk acknowledges the precarious position his club finds itself in – after a 30th-place finish in the standings and a summer filled with off-ice controversies. “Right now, we’re kind of in the dumpster,” Melnyk admits. But stripping aside any awkwardness that may have existed in the video, Borowiecki does open by asking a pointed question to Melnyk that has been on the minds of Sens fans for several months. And for the first time since he spoke to season-ticket holders during town hall meetings in April, Melnyk shed some light onto the organization’s line of thinking heading into the 2018-19 season. Later in the video, Melnyk goes into greater detail about the youth movement in Ottawa, suggesting nearly two-thirds of the roster could be comprised of fresh, young faces by the time the 2019-20 campaign launches next fall. The owner was not shy about using the term “rebuild” – dropping it into the conversation on multiple occasions in the video. These pointed comments from Melnyk on Monday indicating that a major roster turnover is imminent will only serve to heighten the speculation surrounding Erik Karlsson. The club’s captain is set to become an unrestricted free agent at the end of the season and has been subjected to trade rumours for the better part of nine months. But things on that front have stalled, as the organization has fallen into a cone of silence. Melnyk’s late-night video on Monday almost seemed to be a precursor to a Karlsson trade, which could happen before the club opens training camp on Thursday. Based on the timeline Melnyk laid out for a rebuild, it would seem highly unlikely that Karlsson would fit into their plans. And while the club reportedly made an initial contract offer to the Karlsson camp in early July, there has been a lack of tangible and concrete negotiations between the two parties over the past two months. Borowiecki and Melnyk spoke at length about the need for chemistry inside the Senators locker room – which Dorion admitted was fractured last season. An imminent roster overhaul may not go over well with Senators fans, who have kept the club at arm’s length during the recent turmoil. 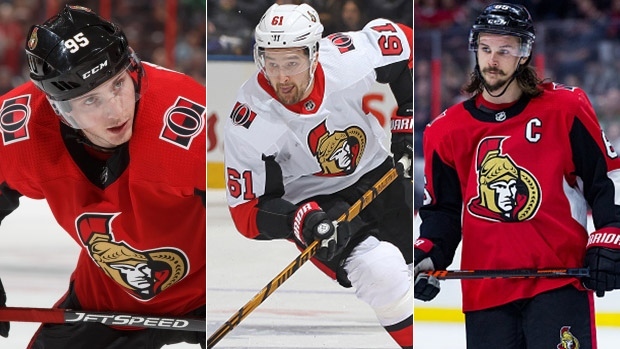 Trading the likes of Karlsson – and possibly Matt Duchene and Mark Stone down the road – certainly won’t help to fill the seats inside the Canadian Tire Centre. But Melnyk believes the fans will buy into this new plan – contingent on the organization being transparent. Melnyk also used a portion of the video to end any speculation that he might be interested in moving the Senators to a different market. Prior to the outdoor game in Ottawa last December, Melnyk ruffled some feathers by openly musing about relocating the franchise if ticket sales didn’t improve. On Monday night, Melnyk went out of his way to alleviate any fears of the team moving to a new city. The problem is, it certainly feels like the biggest noise – possibly a sonic boom – is still around the corner if the Senators decide to trade Erik Karlsson this week.